I recently had some transmission work done and learned a lot from it. One of the most important things I learned is how expensive the automatic transmission in the 4Runner is to overhaul when it fails. I also learned what can be done to make it stand up to the increased output the supercharger provides. 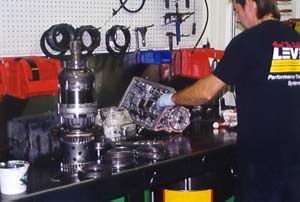 The stock transmission, although very durable, does have its limitations. I had about 75,000 miles total on my 4Runner and about 31,000 miles with the supercharger. One day I was accelerating and when it shifted into second, the RPMs increased and the rev limiter kicked in. It was clear that the second gear clutch slipped. I always wondered if there was anything that could be done to beef up the transmission so it will stand up to the increase in output provided by the supercharger. I had been looking for some time. 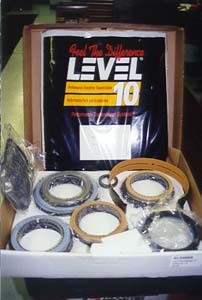 JD from OZ told me about a company called Level 10 that does performance work on the Toyota transmission. With a quick Internet search I found their URL. ( http://www.levelten.com ). I called and spoke to Pat the owner. After telling Pat what modifications I had made to my 4Runner, he told me I had better get the valve body modification done ASAP. I made an appointment for a couple of weeks later. He also talked me into a torque converter upgrade. Between the time I made the appointment and went to Level 10 is when my transmission slipped. I parked it until it was time for the road trip to Level 10. The problem is that the transmission is set up to provide a slow, soft "luxury" shift. Well that may be nice on the stock engine, but when you crank up the power the luxury shift is bad. The stock unit is set up to slowly engage the clutch packs to give that soft shift. The longer it takes the clutches to engage to more they wear and the more heat is generated. With more power you just add to the heat and wear. 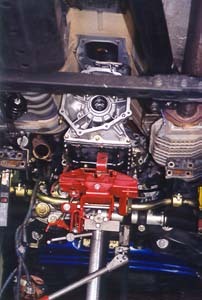 Level 10 reworks the valve body so that the clutch packs engage much faster. 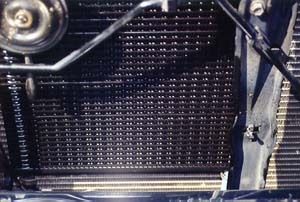 This reduces wear and heat generated. Because it also applies more clamping pressure, the clutch packs can hold more power. Pat told me that the better after market supercharger kit makers recommend this upgrade to prevent damage to the transmission. He said that Stillen makes a kit for the Maxima and they flat out tell people not to install the belt on the supercharger until Level 10 reworks the valve body in the transmission. Pat says that if the upgrade is not done on the Maximas transmission it will be ruined with just one full throttle application with the supercharger. I arrived at Level 10 at 0700 hours and Pat jumped in for a test drive. He mashed on it from a standing stop. "Wow, it is real torquey!" Then it started to shift into second. "One thousand one, one thousand two, thats not good. We are going to have to open it up." Remember it only slipped one time before without any warning. My 4Runner was pulled into one of the bays and within a couple of hours my transmission was torn down and I was handed a stack of second gear clutch and reaction plates and told "you blew through second." I could clearly see where the fiction material was worn through on the clutch plates and the heat damage on the reaction plates. The metal on the surface of the reaction plates was blue and galled. Pat made it very clear that if I had had my valve body upgraded it would have prevented the damage to the clutch pack and eliminated the need for the expensive overhaul. The upgrade is more involved then installing a "shift kit" in a domestic transmission. On the domestics you just change the separation plate and install new springs in the valves and you are done. The transmission used in the 4Runner (not made by Toyota by the way) has a much more complex valve body. It requires in shop modification by Level 10. I was lucky, I only live five hours from them so it was easier just to drive there. For those of you that live some distance away you can remove the valve body yourself and ship it to them. They will modify it the day they get it and FedEx it back to you. It is real easy to remove from the vehicle. Remove the pan and filter. Pull out a small metal pipe that is pressed in the valve body and the case. Remove 12 10 mm bolts and let it drop down a bit. Unhook the kick down cable from the pressure valve. Wrap it up in plastic and ship it off. You will also get three new valve springs to install with it when you get it back. I wish I knew about this BEFORE I smoked my second gear clutch pack. A $600 valve body upgrade could have saved me a few thousand $ it cost me for the overhaul. Do yourself a favor and get this done if you have a supercharger or do a lot of towing. With the second gear clutch pack "blown through" there was no question that I needed the transmission overhauled. Pat sat me down and went over my options. I ended up going to most expensive route because although Pat and his guys are great to hang out with, I really did not want to have to visit with them again. I chose to have the best clutch plates available installed. They are made by Raybestos and are only available through Level 10 for this transmission. Pat calls them the "Blue Plate Specials." The special fiction material is bonded to the plate with a resin that gives them a blue color and that is where the name comes from. These plates also require special reaction plates called Kolene steels. The Kolene reaction plates are much thicker then the stock plate to absorb more heat and the surface is specially treated. The Blue Plate Specials are available in an overhaul kit that Level 10 sells so you can have it done by your local shop if you want. Pat allowed me to watch the entire process and I learned a lot from the experience. His guys are great. The transmission used by Toyota is a very complex unit and I was impressed on how meticulous the Joe at Level 10 was that worked on my transmission. Although Level 10 has lots of bays, most of their work is shipped to them from all over the world. Transmissions arrive by truck on pallets and they do their thing and ship them back out. Pat say that about 70% of their business comes from the middle east so their work has to be done right the first time every time, it is not like the customer can just bring it back. Pat sold me on the idea of having my torque converter upgraded to a performance version. The trouble was they could not find a core to modify before I got there. I guess the stock Toyota converters hold up real well and there are not a lot of bad ones out there to use as cores. Pat rented a car for me and let me drive my torque converter to Pro Torque in Long Island, New York. Pat called ahead and told them exactly what was to be done and worked it out so I could watch the whole process. This is not normally done to protect the trade secrets involved. It was made clear that no pictures were allowed. I did feel honored. With in minutes of arrival my torque converter was cut open and disassembled. The guys commented that it look like I had been babying it due to the little amount of wear and how extremely clean it was on the inside (I have my transmission power flushed every 30,000 miles). I can not tell you exactly what they did to modify it. They asked me not to. I can speak in general terms. The angle of the blades on the impeller is changed. The stator is machined down and the distance between the impeller and turbine is changed. They also modify the lock-up clutch. In the stock converter the fiction material is in the face of the turbine. Pro Torque grinds this off and modifies the face of the turbine and applies a ceramic friction material to the face of the pressure plate. The whole thing goes through a final inspection and then it is placed in a special jig that holds everything together and it is tack welded. This is a custom jig that was developed in house. The converter is then placed in a custom automatic welding machine and the seam is welded. It is then pressure tested for leaks, balanced, painted, boxed, and handed to me for the trip back to Level 10. I was really impressed with Pro Torques facility and hospitality. There are some terms you might want to know so you will know what I am talking about. Stall Speed- When you apply full power and hold the car still with the brakes the stall speed it the maximum RPM the engine will produce with no forward movement. Flash Speed- Without holding the brakes, snap the throttle full open from a standing start and the RPM will quickly run up to and then hold briefly as the vehicle starts moving. The RPMs will then start to climb again. This pause is called the "flash speed." Torque Multiplication- I am not completely sure what this is or how it is measured. The engine will run ahead of the torque converter and then the converter quickly catches up. I think is like a sling shot effect. I have been told that the stock converter has a 1.6 to 1 multiplication factor. My modified one has a 2.5 to 1. When I know more I will update this section. I think my stock converter had a stall of about 2200 RPM with a flash of 2500. I found it hard to test the modified one. The tires start smoking way to soon. I had to place it in 4x4 so I could use the front brakes to help hold the tires still. The stall was 3700 RPM. I still could not check the flash. I found it hard to watch the tachometer with the 4Runner going sideways. The ideas here is to allow the engine to quickly rev up to the point of maximum torque without load and then dump the power to the wheels. It is like revving it up with a stick shift and then quickly letting out the clutch. After driving it a while I have decided the high stall of the modified torque converter is perfect if I was doing nothing but drag racing. I do not drag race and feel that a lower stall would be better suited for my style of driving. I think a stall of 3000 RPM would be perfect for me. I called Pat at Level 10 and talked to him about it. Pat offered to install another modified converter at no charge. I can not ask for anything more. He had me call Pro Torque and I spent some time talking to Joe. He had me email him some of my dyno runs so he could figure out what he needs to do to get the stall just right for me. He made the same modifications to my converter as they do on the turbo Supra. It does appear that the modification has had close to double the effect on my supercharged 4Runner. This is most likely due to much more instant low-end input torque. Joe says he has it nailed down and has a new converter waiting for me at Level 10. I returned to Level 10 and had the new converter installed. Pat and I jumped in for a test drive. We were both very pleased with the way it turned out. This converter is absolutely perfect. It has very close to the same performance increase as the first one without that "spongy, disconnected" feeling below 3500 RPM. I have spent some time driving with the new converter. I have can not find and negative side affects at all. There is dramatic performance increase over stock and it is completely "streetable." I can drive it in stop and go traffic and really take advantage of the performance increased when I want to. This is the perfect torque converter for the supercharged 4Runner. Ill bet that it would be nice for the normally aspirated 4Runner. In a straight line on level dry pavement, I can quickly apply full throttle and the tires bite hard and there is instant acceleration with this new converter, unlike the first one. With the same throttle application the tires would just smoke and there was very little acceleration unless I had it in 4H. For those of you that want to get this Torque Converter it is available through Level 10. Just tell Pat you want the "Gadget model" (PTC T040-20RS). Pat and Joe, I just want you to know you have done a great job getting my converter "just right" for me. I also want to thank you for the personal attention you gave me on my visit to your shops. Your customer service is second to none, thank you very much! 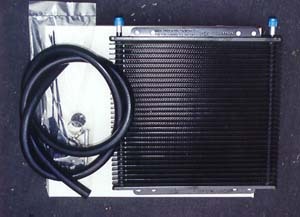 Have you ever wondered whether you need to add an auxiliary transmission cooler? It looks like you do. A while ago I installed a transmission temperature gauge. What I learned from this is that the temperature in the transmission varies quite a bit. When I am accelerating from a standing start I can see the temperature gauge climb almost as fast as the speedometer. Once I reach highway speed and the clutch in the torque converter engages the temperature will drop right off quickly. Aggressive stop and go driving will cause the temperature to climb very high. I have had it as high as 300 degrees. It is clear that when the torque converter is active it does generate a lot of heat. I asked Pat of Level 10 if I should install an auxiliary transmission cooler. He suggested I install the largest transmission cooler that will fit behind my grill. He also said that it should be a stacked plate type and to stay away from the tube and fin type. He then handed me an 11x17 inch stacked plate cooler rated at 30,000 pounds made by Hayden to take home with me. Pat says that 9 out of 10 transmission failures are due to excessive heat. There is two lines of thinking on how the cooler should be installed. One is so the fluid goes from the transmission to the auxiliary cooler, then through the stock cooler built into the radiator and then back to the transmission. The second method is to have it flow through the stock cooler, then the aux cooler and back. That is the way mine is currently installed at the suggestion of the pros at Level 10. Level 10 is in a mountain area in NJ and on my way home driving through the mountains I just could not believe how hot may transmission got. I think this was mostly due to the high stall of the new converter. I think that it should be a close approximation of what it must be like to tow something. It gets very hot. I installed the cooler the morning after I got home. It does a great job of keeping the temperature where is used to be with the stock torque converter. I expect that when I install the converter with the lowered stall I will change the routing of the aux cooler so that the fluid will go to the aux cooler first then the stock cooler. This way it wont over cool in the winter. The shifts are instant and very crisp and feel rock solid. I no longer worry about the transmission being the weak link. I have been told that with my transmission shifting faster and putting more power to the wheels quicker, I have cut my � miles times by at least a full second. I guess that would be important if I was a drag racer, I am not. I do love the way it feels when I drive it. The occasional tire chirps during shifts are a real kick in the pants. It also turns the heads of many of the traditional hot-rodders.